We have a beautiful 5000 square foot showroom in Pompano Beach. We have many materials to offer: Adhesives, Area Rugs, Backsplashes, Baseboard, Bullnose, Carpet, Carpet Tiles, Ceramic Tile, Cork, Crown Moldings, Door Casing, Engineered Wood, Floor Moldings, Glass, Granite, Laminate, Limestone, LVT, Marble, Moldings, Mosaics, Natural Stone, Porcelain Tile, Rubber, River Rock, Slate, Solid Wood, Staircase Solutions, Thresholds, Travertine, Underlayment Pad, Wool, VCT, and Vinyl. Contact us today for help finding the right material for your project. At Atlantic Stone Source, we have created an aesthetic, elegant and stylish difference in our products by combining the culture of old civilizations with the latest in production technology. Sourced from well known quarries, we produce the highest quality travertine and marble products in a wide variety of colors and finishes. Atlantic Stone Source counts with over 20 years of experience in the natural stone industry. We have acquired a solid reputation because we pride ourselves in providing our customers with knowledgeable, courteous, well-trained professionals who will help you select a material that will enhance any project while giving you the most competitive pricing in the market. 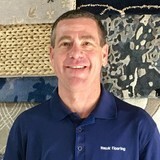 "Every job is custom" and that's why for 27 years Hawk Flooring has had a commitment to excellence in our approach to facilitating your flooring needs. Our emphasis is providing high quality and professional installations, as we feel this is the only sustainable business model in South Florida. Having grown up in Delray Beach and witnessed first hand the growth that the area has experienced, we understand the difficulties that our neighbors encounter in finding quality tradesmen and that's why Hawk Flooring strives to meet or exceed your expectations on every project. Give us a call today, we would love to hear from you! We provide all of the latest trends and styles, at the lowest prices available, alongside the most friendly and knowledgeable staff in the industry. We are here not only to personally assist you in your decision making process, but to help you add value, style, and a strong foundation to your project. Serving South Florida since 1979. We sell and install all types and categories of flooring, including walls and counter tops. Our labor is guaranteed to be free of installation defect for as long as you own the floor. We have been members of the largest network of flooring companies, Carpet One Floor & Home, since 1986; featuring unparalleled warranties. Custom Couture Rugs focuses on your design inspiration in making your home or commercial space come alive. The finest organic vegetable dyes and yarns are used to create your unique rug. We offer a complete custom rug design system, including custom colors, patterns, designs, and shapes. Our efficient system allows for the most competitive pricing, efficiency in ordering and manufacturing ensuring that your clients will receive the utmost in customer satisfaction. We offer complimentary 3-Dimensional CAD Renderings and strike offs. Once approved, our average production time from is 8-10 weeks. Combining the best interior designer's modern ideas with ancient Tibetan craftsmanship to create the world's finest rugs! Kaymanta is a company that specializes in the manufacture of fine area rugs and deco accessories. The premium material used for the manufacture of our products is carefully selected, to always deliver excellence in both design and quality. With the possibility to mix and match colors, measures and even designs, everyone is guaranteed to find the article they are looking for. Kaymanta offers a variety of luxury rugs in different textures and exclusive decor accents. However, our best trait is the personalized service we give each of our clients, and the possibility to customize each rug and individualize it. We understand flooring is the foundation of decorating. It sets the tone for your home and reflects your taste and lifestyle. At Floors To Go, it's our job to help you make your shopping experience a positive one. Floors To Go - Shop at Home offers professional premier in home shopping and consultations. Call Today to schedule an appointment! Roy (Tony) Cisneros has been in the industry of wood floors since 1985. As time went by his work became popular by word of mouth and his work load increased and then founded All American Floors, Inc. in 1993. Since then, All American Floors has grown to be successful and carry a reputation for its great work in wood flooring. Our company takes pride in each and every flooring job we do. We have passion in what we do and take great joy in our work. Family owned and operated with much experience. All American Floors is the best choice for a job done right. Jessica Waldorf Inc. is a full service, Palm Beach interior design company specializing in contemporary design with a chic influence. Whether designing residential or commercial spaces, Jessica has built a reputation on achieving highly individual results for a discerning, international clientele. Jessica Waldorf Inc. was founded with a simple idea: Love where you live. So we set out to create a smart, accessible and personal service that works whether you’re accessorizing or gut-renovating. By giving our clients access to top emerging interior design talent, the world’s best shopping experience, and exceptional customer service (we’re fanatical about it), we’re making it easy to love where you live. We are a family owned business and have been serving the Palm Beaches for over 70 years. Solid wood floors have and continue to be our business. We sell floors that are made to last, easy to care for and can be refinished time and again. We have floors that were installed in the first year of our business that are still in use today. We are Colonial Floor and Stone Care, South Florida’s Premiere Terrazzo, Marble, Granite, Mexican Tile and Concrete restoration Company. We take pride in the fact that we have been the leader in historic terrazzo restoration in the South Florida area for over twenty years. It is a true labor of love. The newest trend today is concrete polishing and acid staining. Whether its your living area or your old, tired garage, Colonial Floor and Stone Care can rejuvinate dull, cracked, and stained concrete. Not only is concrete polishing a head turning improvement to your home, it is also a durable floor that with easy maintenance lasts. We can also add decorative techniques that will turn your dull, gray concrete a true work of art. We are located in Fort Lauderdale, but have been serving the Miami/Dade, Broward and Palm Beach counties satisfying many customers with our professional services. All of our technicians are highly trained in our restoration process, cleaning and polishing your natural stone. Experienced trained professionals will treat your floors with the care as if they were our own. Each potential client will be given a complimentary consultation to fit your needs. *Authorized Dealer of Shaw Floors* The Art of Flooring Begins Here! Kuhn Flooring Gallery has been serving South Florida for over 30 years. Our exceptional team of professionals is dedicated to quality and personal service. We supply and professionally install residential and commercial flooring and window treatments...hardwood, laminate, porcelain and ceramic tile, marble, carpet as well as custom area rugs, luxury vinyl tile, and much more! We will be glad to assist you in making a selection that best suits your needs at affordable prices. Our expertise gives us the unique ability to meet your needs at any stage of the development process. Our Kuhn Flooring Gallery team works directly with contractors and architects to specify commercial products and methods of installation. We facilitate projects ranging from small residential installations to extensive commercial installations. We are additionally capable of preparing a proposal for any installation in accordance with your specifications and, due to our thorough knowledge of materials, applications, and code requirements; we can assist with the preparation of an installation schedule and specifications for your proposal. Our scope of work includes design and installation of a variety of flooring products while highlighting quality control, operational efficiency, and superior customer service. Additionally, Kuhn Flooring Gallery guarantees a one year standard warranty on all installations so as to best satisfy our customers. With professional project management and a qualified staff, Kuhn Flooring Gallery is able to meet the unique needs of a variety of customers. At Kuhn Flooring Gallery, we are here to assist in the transformation of your commercial property as well as the home of your dreams. Please consider us for your next project! Carpeting is subject to a significant amount of wear and tear, so it’s crucial to make sure a new carpet installation is done correctly, or that an existing rug is maintained properly. Enter Pompano Beach carpet dealers. From carpet repair to custom carpet design, these professionals specialize in anything and everything that is carpeting, and can help ensure that your Pompano Beach, FL home’s new rug starts off — and stays! — in great shape. Carpet dealers in Pompano Beach, FL help homeowners choose the correct carpet covering for their floors, and also assist with carpet maintenance. This includes determining factors like material, carpet pile, durability, color and size, as well as helping with any custom carpet design. After completing the initial installation (which includes removal of the old flooring, if applicable, and surface prep), they may also handle follow-up maintenance requests such as carpet cleaning, carpet repair and carpet stretching. Find a carpet dealer on Houzz. Narrow your search in the Professionals section of the website to carpet dealers in Pompano Beach, FL, and read reviews and ratings for pros in your area.